Went to her new home on Saturday 22nd June 2013. 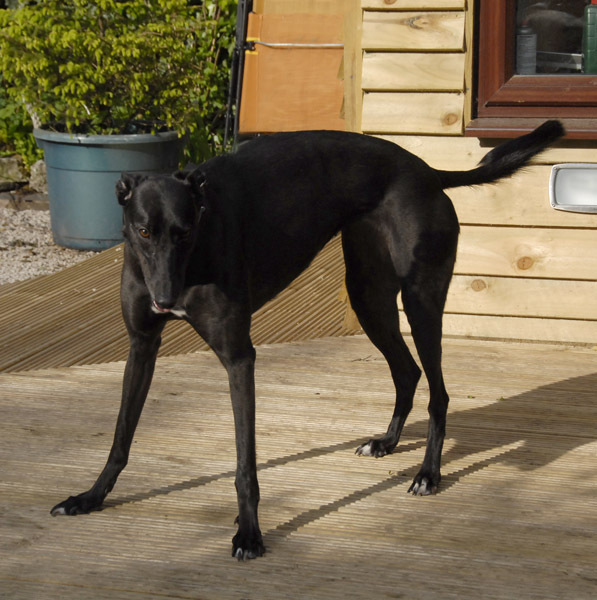 Sooty is a beautiful black ex-racing greyhound who was born on the 5th July 2010. She weighs about 28k and from what we've been told she is small dog friendly, but this we will check. She is a very happy and affectionate girl whose tail never stops wagging. She enjoys playing with tennis balls, but we are not sure yet if she will fetch one, but she enjoys playing with them on her own. Sooty is inoculated, microchipped and travels well in the car. She also has a scar on her back resulting from a bite, which occurred when she was a puppy, but this is hardly noticable and it doesn't seem to bother her. 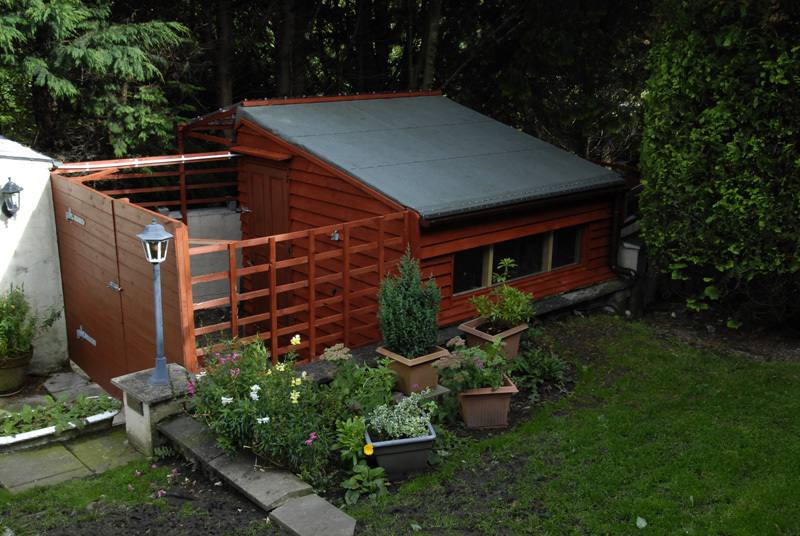 * The branch kennel at the bottom of our garden is where Sooty and the other resident(s) will be for the first day or so until she gets to know the other greyhounds. She has use of our garden and paddock, and once she gets to know the other dogs she will be allowed in the house during the day and all the dogs will then take it in turn to sleep in the house at night, so they become use to sleeping in both the kennel and the house. Sooty is so good in the kennel, but she still isn't eating her full portion of food. This is possibly because she's coming out of a season, which can affect their appetite along with other things. After we first let her out she had a good run round the garden then we put her muzzle on and introduced her to each of the dogs in the house one at a time. All the foster dogs wore muzzles. She was so happy to meet them all and things were a bit chaotic for a few minutes then they all calmed down and she enjoyed roaming the garden with the others. 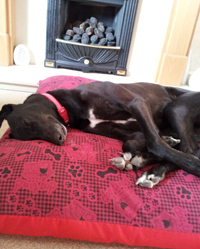 After she'd been fed she enjoyed tottering around the garden, taking a nap on the quilt on the decking and when it got a bit too warm she went back to her bed in the kennel for a nap. She didn't come in the house today because I was so busy with the bed and breakfast rooms that I couldn't keep an eye on them, but it was so nice outside she didn't really need to. Sooty lay on the decking in the garden with Lena in the evening sunshine till quite late, then we gave them a chew each and popped them in the kennel for the night along with Charlie. Sooty just lay down and went straight to sleep. What a lovely dog she is. Sooty's new owner called today to adopt her and take her home with her. Her new owner came with her daughter as she did last weekend when she called to see the dogs and chose Sooty. Sooty remembered them and gave them a lovely welcome. 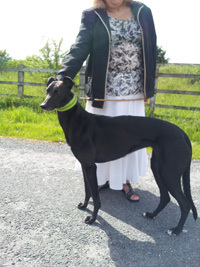 Once all the adoption paperwork was complete and coats purchased, off she went with them to her new home where we hope she will have a long and happy life with her new name of Mitzy. We've just heard that Mitzy is doing very well and seems a happy dog. She has been introduced to the grandchildren who all love her to bits. Her new owner says she is now no longer the main reason for a visit. We received an email today letting us know that the change in Mitzy is really apparent in just one week! The greeting as they all arrive for a visit and the enthusiastically playing with children is wonderful. However, is 5.00 am a usual wake up time though?! This evening Mitzy arrived to stay for a couple of days so we could arrange for her to be spayed. She was happy to see us and relaxed the moment she arrived. Her new owner found it quite difficult to leave her and will be looking forward to Sunday afternoon when she is collecting her again. We put muzzles on all our foster greyhounds so they could meet Mitzy and they all introduced themselves in the garden. She ate her tea then her and Indi stayed in the kitchen area while the others were behind the gate in the living room, while we went out to collect something. When we arrived back we received a huge welcome, only the type that Mitzy can do! This morning Mitzy went to the vets to be spayed where she weighed in at 28.5k. All went well and we collected her in the afternoon. As soon as she got home she went straight into the crate, which we were pleased about and we shut the door to allow her to sleep things off in peace. Later in the evening she ate a little, went in the garden to do her toilet then settled back in the crate for the night. Mitzy was feeling a lot better this morning and had her breakfast then wandered around the garden on and off during the day in between resting. Mitzy's owner called in to collect her this afternoon and what a lovely welcome she received. Her spay had gone well and hopefully will remain that way until her stitches are removed. Mitzy had been really good, and hopefully we shall see her again before too long. We heard today that Mitzy is doing okay now after her spaying operation, but she had a reaction to the plaster. She was on tablets for a week and cream which the vet told her new mum to put on before walks then it will not matter if she licked on her return. They are already working and she is doing well. The stitches came out on Monday and the vet was pleased. She is happily laying on sofa right now with her legs in the air. Mitzy is very happy, healing well and her coat is beginning to grow back. While Snowy was out walking with his new owner this morning they 'bumped' into Mitzy and her owner - both dogs got on well together.